The dissenting academies were schools, colleges and seminaries run by English Dissenters, that is, those who did not conform to the Church of England. They formed a significant part of England’s educational systems from the mid-seventeenth to nineteenth centuries. Watts also introduced a new way of rendering the Psalms in verse for church services, proposing that they be adapted for hymns with a specifically Christian perspective. As Watts put it in the title of his 1719 metrical Psalter, the Psalms should be "imitated in the language of the New Testament." Besides writing hymns, Isaac Watts was also a theologian and logician, writing books and essays on these subjects. In Watts' Logic, there are notable departures from other works of the time, and some notable innovations. The influence of British empiricism may be seen, especially that of contemporary philosopher and empiricist John Locke. Logic includes several references to Locke and his Essay Concerning Human Understanding ,  in which he espoused his empiricist views. Watts was careful to distinguish between judgements and propositions, unlike some other logic authors. According to Watts, judgement is "to compare... ideas together, and to join them by affirmation, or disjoin then by negation, according as we find them to agree or disagree". He continues, "when mere ideas are joined in the mind without words, it is rather called a judgement; but when clothed with words it is called a proposition". Watts' Logic follows the scholastic tradition and divides propositions into universal affirmative, universal negative, particular affirmative, and particular negative. The earliest surviving built memorial to Isaac Watts is at Westminster Abbey; this was completed shortly after his death. 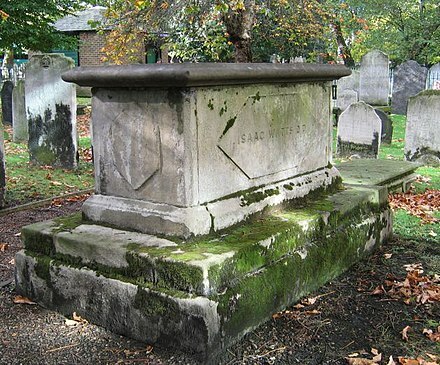 His much-visited chest tomb at Bunhill Fields dates from 1808, replacing the original that had been paid for and erected by Lady Mary Abney and the Hartopp family. A stone bust of Watts is installed at the nonconformist Dr Williams's Library, in central London. The earliest public statue, erected in 1845, stands at Abney Park, where Watts had lived for more than 30 years at the manor house, where he also died. The park was later devoted to uses as a cemetery and public arboretum. A later, rather similar statue was funded by public subscription and erected in a new Victorian public park named for Watts in Southampton, the city of his birth. In the mid-nineteenth century, the Congregational Dr Watts Memorial Hall was built in Southampton and named for him. After World War II, it was lost to redevelopment. The Isaac Watts Memorial United Reformed Church was built on the site and named for him. One of the earliest built memorials may also now be lost: a bust to Watts that was commissioned on his death for the London chapel with which he was associated. The chapel was demolished in the late 18th century; remaining parts of the memorial were rescued at the last minute by a wealthy landowner for installation in his chapel near Liverpool. It is unclear whether the bust survives. The stone statue in front of the Abney Park Chapel at Dr Watts' Walk, Abney Park Cemetery, was erected in 1845 by public subscription. It was designed by the leading British sculptor, Edward Hodges Baily RA FRS. A scheme for a commemorative statue on this spot had first been promoted in the late 1830s by George Collison, who in 1840 published an engraving as the frontispiece of his book about cemetery design in Europe and America; and at Abney Park Cemetery in particular. This first cenotaph proposal was never commissioned, and Baily's later design was adopted in 1845. In 1974, the City of Southampton (Watts' home city) commemorated the 300 year anniversary of his birth by commissioning the biography Isaac Watts Remembered, written by David G. Fountain, who like Watts, was also a nonconformist minister from Southampton. ↑ Mable, Norman, Popular Hymns and their Writers, p. 179 . ↑ Boreham, F. W. (1945), A Late Lark Singing, p. 29 . 1 2 Marini 2003, p. 76. ↑ Marini 2003 , p. 76 lists hymn writers who followed in the tradition established by Watts, including Charles Wesley, Edward Perronet, Ann Steele, Samuel Stennet, Augustus Toplady, John Newton, William Cowper, Reginald Heber, Samuel Davies, Timothy Dwight, John Leland, and Peter Cartwright. ↑ Historic England. "Monument to Isaac Watts, East Enclosure (1396517)". National Heritage List for England . Retrieved 24 February 2014. ↑ Watts, Isaac, The Poems of Isaac Watts, Volumes 44–46 , Press of C. Whittingham, 1822, p. 193. Bunhill Fields is a former burial ground in central London, in the London Borough of Islington, just north of the City of London boundary. The site is managed as a public garden by the City of London Corporation. It is about 1.6 hectares in extent, although historically it was much larger. A Selection of Hymns for Public Worship is a hymn book compiled by William Gadsby, a minister of the Gospel Standard Strict Baptists in England. First published in the 19th century, it is still in current use. Abney Park cemetery is one of the Magnificent Seven cemeteries in London, England. Exclusive psalmody is the practice of singing only the biblical Psalms in congregational singing as worship. Today it is practised by several Protestant, especially Reformed denominations. Hymns besides the Psalms have been composed by Christians since the earliest days of the church, but psalms were preferred by the early church and used almost exclusively until the end of the fourth century. During the Protestant Reformation, Martin Luther and many other reformers, including those associated with the Reformed tradition, used hymns as well as psalms, but John Calvin preferred the Psalms and they were the only music allowed for worship in Geneva. This became the norm for the next 200 years of Reformed worship. Hymnody became acceptable again for the Reformed in the middle of the nineteenth century, though several denominations, notably the Reformed Presbyterians, continue the practice of exclusive psalmody. The Genevan Psalter, also known as The Huguenot Psalter, is a metrical psalter in French created under the supervision of John Calvin for liturgical use by the Reformed churches of the city of Geneva in the sixteenth century. The New Century Hymnal is a comprehensive hymnal and worship book published in 1995 for the United Church of Christ. The hymnal contains a wide-variety of traditional Christian hymns and worship songs, many contemporary hymns and songs, a substantial selection of "world music" selections origin, a full lectionary-based Psalter, service music selections, and a selection of liturgies from the UCC Book of Worship (1986). Generally speaking, the hymnal is theologically within the "mainline" Protestant tradition, with a slant toward liturgical forms. Andrew Reed was an English Congregational minister and hymnwriter, who became a prominent philanthropist and social reformer. He was the father of Sir Charles Reed and grandfather of Talbot Baines Reed. Mary, Lady Abney inherited the Manor of Stoke Newington in 1701 from her brother. The property lies about five miles north of St Paul's Cathedral in the City of London. She had a great influence on the design and landscaping of Abney Park, including the planting of the two elm walks that lead to Hackney Brook. 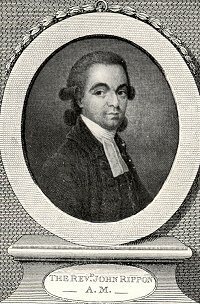 John Rippon was an English Baptist minister. In 1787 he published an important hymnal, A Selection of Hymns from the Best Authors, Intended to Be an Appendix to Dr. Watts’ Psalms and Hymns, commonly known as Rippon's Selection, which was very successful, and was reprinted 27 times in over 200,000 copies. 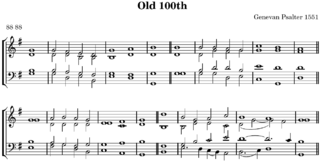 Many hymns originally published in Rippon's Selection are preserved in the Sacred Harp. Presbyterian worship documents worship practices in Presbyterian churches; in this case, the practices of the many churches descended from the Scottish Presbyterian church at the time of the Reformation. "Our God, Our Help in Ages Past" is a hymn by Isaac Watts that paraphrases the 90th Psalm of the Book of Psalms. It originally consisted of nine stanzas; however, in present usage the fourth, sixth, and eighth stanzas are commonly omitted to leave a total of six. In 1738, John Wesley in his hymnal, Psalms and Hymns, changed the first line of the text from "Our God" to "O God." Both Watts' wording and Wesley's rewording remain in current use. Josiah Conder, correspondent of Robert Southey and well-connected to Romantic authors of his day, was editor of the British literary magazine The Eclectic Review, the Nonconformist and abolitionist newspaper The Patriot, the author of romantic verses, poetry, and many popular hymns that survive to this day. His most ambitious non-fiction work was the thirty-volume worldwide geographical tome The Modern Traveller; and his best-selling compilation book The Congregational Hymn Book. Conder was a prominent London Congregationalist, an abolitionist, and took an active part in seeking to repeal British anti-Jewish laws. Psalm 108 is the 108th psalm of the biblical Book of Psalms. In the Greek Septuagint version of the bible, and in its Latin translation in the Vulgate, this psalm is Psalm 107 in a slightly different numbering system. Dwight Leslie Armstrong was a composer of Christian hymns based upon texts from the Psalms and other books of the Christian Bible. He was the younger brother of American evangelist Herbert W. Armstrong, and uncle of American evangelist Garner Ted Armstrong. He was married to Karen Hill Armstrong and was the father of one daughter, Deborah. Psalm 84 is the 84th psalm of the Book of Psalms, generally known in English by its first verse, in the King James Version, "How amiable are thy tabernacles, O Lord of hosts!". The Book of Psalms is the third section of the Hebrew Bible, and a book of the Christian Old Testament. In the Greek Septuagint version of the bible, and in its Latin translation in the Vulgate, this psalm is Psalm 83 in a slightly different numbering system. In Latin, it is known as "Quam dilecta tabernacula tua Domine virtutum". The psalm is a hymn psalm, more specifically a pilgrimage psalm, attributed to the sons of Korah. Wikimedia Commons has media related to Isaac Watts .